The University of Central Arkansas (often referred to as Central Arkansas or UCA) is a public research university in Conway, Arkansas. 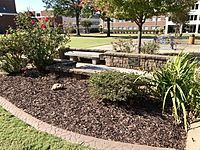 Founded in 1907 as the Arkansas State Normal School, the university is one of the oldest in the U.S. state of Arkansas. As the state's only normal school at the time, UCA has historically been the primary source of teachers in Arkansas. Today with a more academically diverse mission, UCA is noted for its nationally recognized programs in nursing, education, physical therapy, business, performing arts, and psychology. UCA is home to the Norbert O. Schedler Honors College, which is known for being one of the first honors colleges in the United States. The honors program derives its pedagogical underpinnings from the traditional small liberal arts college. It prides itself on small class sizes, intimate teacher/student relationships, and intense study of a variety of interdisciplinary subjects. The university comprises six colleges: the College of Fine Arts and Communication, the College of Natural Sciences and Mathematics, the College of Business, the College of Health and Behavioral Sciences, the College of Liberal Arts, and the College of Education. 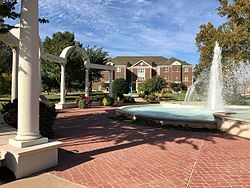 In addition to this UCA is home to five residential colleges and one commuter college, those being the HPaW Residential College, EDGE Residential College, The Stars Residential College, STEM Residential College, EPIC Residential College, and the Minton Commuter College. UCA has about 12,000 graduate and undergraduate students, making it one of the largest universities in the state. The university maintains a student-to-faculty ratio of approximately 17 to 1. Over 150 undergraduate, graduate, and professional programs are offered at the university. UCA occupies over 120 buildings within its 356 acres (1.44 km2). Harding Plaza in front of Irby Hall. The Arkansas State Legislature created the Arkansas State Normal School, now known as the University of Central Arkansas, in 1907 by passage of Act 317 on May 14. 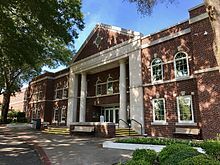 The purpose of The Arkansas State Normal School was to properly train students to become professional teachers and centralize teacher training. Classes began September 21, 1908 with nine academic departments, one building on 80 acres (320,000 m2), 107 students and seven faculty members. Two faculty members taught in two departments and President Doyne taught pedagogy and Latin. 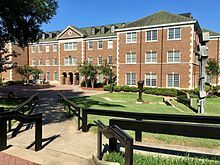 In 1925, Arkansas State Normal School became Arkansas State Teachers College. The name change more accurately reflected the primary focus of instruction and mission of the institution. Flowers looking towards the south, central part of campus. By 1967, the mission of Arkansas State Teachers College had changed. Though teacher training was still an important part of the school's mission, other fields began to expand in liberal arts studies and in the emerging field of health care. To recognize the institution's existing academic diversity another name change was in order. In January 1967, Arkansas State Teachers College became the State College of Arkansas. President Silas Snow, who championed the name change in 1967, organized State College of Arkansas along university lines in preparation for still yet another name change. State College of Arkansas grew rapidly and offered an ever-widening range of degree programs. 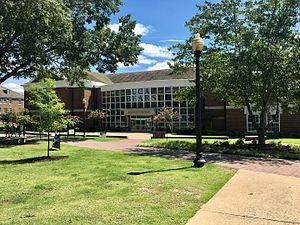 By January 1975, Snow’s efforts were realized as the State Department of Higher Education recommended State College of Arkansas be known as The University of Central Arkansas, or UCA. As of fall 2016, UCA has an enrollment of 11,487 students. Enrollment for 2015 was 11,754 and 11,698 for 2014. Retention for full-time, first-time undergraduates increased from 72.4 percent from fall 2014 to 72.9 percent from fall 2015. Graduate student enrollment is 1,872, while last year the number was 1,867 and the number of transfer students increased to 775 compared to 618 last year. Main Hall, the oldest building on campus. The colors for UCA were decided the first year and according to an article in the November 24, 1908 edition of the Log Cabin Democrat, were said to be purple and silver. President Doyne assigned the task of developing school colors to W.O. Wilson and Ida Waldran in 1908. Wilson was wearing a gray sweater and Waldran was wearing a purple scarf. They chose the colors based upon the color of the clothing they were wearing that day. Both Wilson and Waldran thought that purple and gray complemented each other. Today the official colors for all UCA sports teams are purple and gray. It wasn't until 1920 that the UCA athletic teams had a mascot. According to Dr. Ted Worley, author of A History of The Arkansas State Teachers College, the UCA teams from 1908 to 1919 were referred to by many names, including: Tutors, Teachers, Pedagogues, Pea-Pickers, and Normalites. In 1920 the Bears became the mascot for the teams. However, it wasn’t until April 7, 1921, that the teams were called the "Bears" in print. Dr. Worley also quoted sources as saying the Bear was an appropriate symbol for the school because Arkansas’ nickname was the "Bear State". The women's teams were known as the Bearettes for several years. The name of Sugar Bear came later. Victor E. Bear came about in 1999 and Victoria E. Bear came soon after. Bruce D. Bear became the newest addition to the UCA family in 2006. UCA's Main Hall is the oldest building on campus. 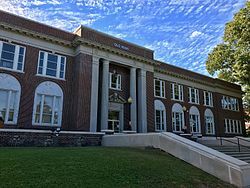 This building was completed in 1919 and was built by George Donaghey, the man for whom Donaghey Avenue is named and a former governor of the State of Arkansas. After the building was built it served a dual role as the administration building and as a classroom building. It continued to serve as the administration building until the 1960s. On February 11, 2011, the building was named on the National Register of Historic Places. UCA's World War II Memorial was dedicated in October 2003. The memorial contains the names and branch of service of forty-six UCA alumni who were killed during World War II. The memorial is a permanent reminder of those UCA alumni who gave their lives fighting for their country. The Senior Walk is located in the courtyard in front of the Student Center. Each year, graduates will have the opportunity to purchase bricks as part of their class year. For $100, graduates can purchase a brick that will be inscribed with his/her name or the name of a graduate that a purchaser wants to honor. Torreyson Library, named after Burr Walter Torreyson. After President Thompson resigned the presidency he was replaced on an interim basis on December 21, 2001 by Dr. John Smith, vice-president of financial services. Smith served in this capacity until September 22, 2002. Hardin took the reins at UCA on September 23, 2002. He has a Bachelor of Arts with high honors from Arkansas Tech University and a Juris Doctorate from the University of Arkansas Law School. Hardin served as an Arkansas State Senator for 14 years and was chairman of the Senate Education Committee and also served on the Joint Budget Committee and Legislative Council. He chaired the Arkansas Advisory Council for Vocational Education and served 12 years as a Professor of Legal Studies at Arkansas Tech University. In addition, he was a trial attorney for 10 years. Prior to becoming UCA’s eighth president, Hardin was Director of the Department of Higher Education for six years. President Lu Hardin announced his resignation at the August 28, 2008 Board of Trustees meeting, following controversy over a $300,000 bonus that had been voted him by the board. He would later plead guilty to wire fraud and money laundering charges. Tom Courtway, UCA Vice President and General Counsel, was then named Interim President. On June 19, 2009, Dr. Allen Meadors was presented as the new president to the Board of Trustees. The event took place in Wingo Hall. Dr. Meadors was a UCA Alumnus who received his Bachelor of Science in Business Administration. Thomas Courtway was appointed the 10th President of UCA in 2012. The University has 6 distinct colleges offering over 150 majors. These colleges are: The College of Business, the College of Education, the College of Fine Arts and Communications, the College of Health and Behavioral Sciences, the College of Liberal Arts, and the College of Natural Sciences and Mathematics. The university is famous for its innovative Honors College, which has received national recognition for its excellence. Small classes, distinguished faculty, TAG and URGE grants for students, high ACT and SAT scores, and outstanding medical and graduate school admission rates are hallmarks of the College. In 2006, U.S. News & World Report ranked UCA 61st in the South in academic excellence. This marks the first year that UCA has been ranked. UCA was the only public Arkansas university in that category. In January 2010, UCA mass communication students launched The Fountain (now The Fountain Magazine), a daily source of news and information. The student-created website is named "The Fountain", after the historic landmark located on the university's campus. The Fountain merged with The Echo UCA's oldest student media outlet in January 2014 to combine print and online resources. The Fountain Magazine was created following the merger. The University of Central Arkansas in Conway, Arkansas, comprises six colleges. In addition to the programs offered at the colleges, it has a study abroad program. Students may, for example, study Literature in Italy and UK, healthcare in China or Sociology in Africa. Credits earned at several foreign universities may be credited towards a degree at UCA. UCA is also recognized as distinct by the Arkansas Department of Higher Education for being one of the nation's 20 Asian Studies Development Program's Regional Centers for Asian Studies, a joint program of the federally funded East West Center and University of Hawaii at Manoa. The courtyard behind Irby Hall. The College of Fine Arts and Communication offers five fields of study for a degree. Available disciplines include music, public relations, communications, theatre, art and writing. Many of the college's degrees enable graduates to work or teach in their chosen profession. The college offers both bachelor and graduate programs. This college offers eight fields of study in physical and natural sciences as well as six pre-professional programs. Undergraduate programs include those in biology, chemistry, computer science, environmental science, general science, mathematics, physics, and secondary science education. Pre-professional programs include pre-dentistry, pre-optometry, pre-medicine, pre-engineering, pre-pharmacy, and pre-veterinary science. The college offers both bachelor's and master's degrees. Business students attending the University of Central Arkansas can pursue an associate, graduate, bachelor or MBA degree through this college. Major fields of study include accounting, economics, finance, innovation & entrepreneurship, insurance, information systems, management, and marketing. This college offers bachelor and graduate degrees in health, exercise and sport science, nutrition, family & consumer sciences, education, psychology, counseling, military science, nursing, physical therapy, occupational therapy and speech pathology. ROTC students at the University of Central Arkansas attend this college for training as a commissioned officer. There are six fields of study available at the College of Liberal Arts. The college offers graduate and bachelor's degrees. Available fields of study include English, religious studies and philosophy, world languages, political science, sociology, and history. The College also supports the inter-disciplinary Asian studies, gender studies, Latin American studies, and Southern and Arkansas studies minor programs. The College of Education (COE) is Arkansas’ premier educator preparation college. We are dedicated to providing exemplary programs for the preparation of professional educators, including teacher preparation, educational leadership, school counseling, library media, instructional technologies, higher education student personnel administration, and other related professional fields. Our results are impressive with UCA graduates scoring above the state and/or national averages on all important indicators of candidate success. offers University of Central Arkansas students Ph.D., educational specialists, master's, and bachelor's degree programs. The COE Dean, Associate Dean, and Teaching and Learning Department Chair are all Apple Distinguished Educators. For more information please visit http://uca.edu/education/. The Student Center went through a major remodeling in the summer of 2008. 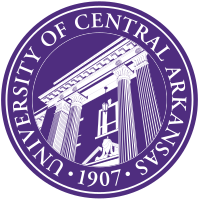 The University of Central Arkansas is Arkansas's premiere dramatic school. The program promotes active student involvement in all areas of production including acting, stage management, scenery, costumes, lights, sound, props, and management. The theatre program participates annually in the Kennedy Center American College Theatre Festival and has walked away with numerous awards. UCA also holds the annual Arkansas High School Audition Day which is a chance for any High School senior interested in majoring in theater to audition before most of the theatre programs in the state of Arkansas. Also, UCA Theatre is accredited by the National Association of Schools of Theatre. This accreditation assures students and parents that the UCA Theatre program meets professional standards of quality in theatre education and training as set forth by the Association. UCA Public Appearances is a division of the University's College of Fine Arts & Communication. Its primary responsibilities are to manage the Donald W. Reynolds Performance Hall—a 1,200-seat, state-of-the-art theater—and to develop and present performing arts programming in the hall. The Reynolds Performance Hall opened on September 15, 2000, with a sold-out concert by the late Ray Charles. Since then, the theater has hosted numerous celebrities, including Loretta Lynn, Rhonda Vincent, Seth Meyers, Gavin DeGraw, the Temptations, Gladys Knight, Ronan Tynan, The Golden Dragon Acrobats, Frankie Valli & the Four Seasons, mezzo-soprano Denyce Graves, Dallas Cowboys owner Jerry Jones, local composer David William Allison, and many national and international touring companies. A four-person full-time staff, two part-time staff, and numerous student workers are employed by Public Appearances. UCA Public Appearances manages UCA Ticket Central, which provides ticketing services for all non-athletic ticketed events on the campus. UCA Ticket Central serves Public Appearances, UCA Theatre, the Conway Symphony Orchestra, the Arkansas Shakespeare Theatre, Student Activities events, and events sponsored by organizations within and outside the University. UCA Public Appearances is supported by State funds, funds generated by the UCA Performing Arts fees, grants, ticket sales, and donations. The university's athletic teams are known as the Bears for men's teams and Sugar Bears for women's teams. Central Arkansas participates in NCAA at the Division I (Football Championship Subdivision football) level as a member of the Southland Conference. The university fields 17 varsity sports involving over 400 student-athletes. The athletic program includes eight men's sports: baseball, basketball, cross country, football, golf, soccer, and track and field; and nine women's sports: basketball, cross country, golf, soccer, softball, tennis, track & field, volleyball and beach volleyball. UCA greek life students are members of one of the 29 Greek organizations hosted by the campus. Greek life was established in 1915. The University is home to more than 200 registered student organizations, with more forming every year. Notable other RSO's include The National Association for the Advancement of Colored People (N.A.A.C.P), Young Democrats, College Libertarians, College Republicans, Sigma Alpha Lambda Honors Society, Student Council for Exceptional Children, PRISM, Business and Information Technology (BIT), Computer Science Club, Model UN, Campus Dialogue, Pre-Med Society, Pre-Pharmacy Club, The Society of Physics Students (SPS at UCA), RUSH Collegiate Ministries, Ultimate Frisbee Club (Abduction), and a myriad of other religious organizations. The Student Government Association, SGA, represents the student body at all times and in all circumstances, in areas such as: allocating and administrating student activity funds; advising the administration in regard to student-related policies; cooperating with faculty in determining student obligations and honors; considering all student petitions to SGA; planning and supervising all SGA elections; and approving charters or cancellations of RSOs. The SGA was created to represent student interests on campus and push for initiatives that are beneficial for the student body. They are there to make sure that students are the number one priority in every decision made at UCA. The Slogan of SGA is: Students First! The SGA is composed of total of forty senators divided into: "The Executive Board" consisting of an Executive President, Executive Vice-President, Vice-President of Operations, Vice-President of Finance. SGA representation from each class shall be as follows: President, Vice-President, Five (5) Representatives. Additional Members: Five (5) Senators at Large, Three (3) Graduate Senators. 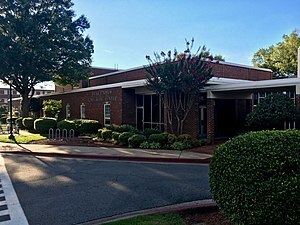 The university established its own academic publishing imprint in 1985 under university president Jefferson D. Farris. It published 23 books by 1996, when university president Winfred L. Thompson closed the press, citing fiscal considerations. Nate Bowie, professional basketballer and UCA single-game scoring record-holder with 39 points in a single game. William Harrison (1935–2010), obstetrician who performed over 20,000 abortions as the only provider in Northwest Arkansas. Sheffield Nelson, lawyer and Republican candidate for governor of Arkansas in 1990, obtained degree in mathematics education from Central Arkansas. Hiroyuki Nishimura, founder and former administrator of the most accessed Japanese message board site 2channel; the current owner of the world's largest English language imageboard 4chan. Memorial Unity Garden in front of Arkansas Hall honoring the victims. On Sunday, October 26, 2008, a shooting took place on the UCA campus shortly after 9:00pm CDT, outside of Arkansas Hall, a campus residence hall. Two students – Ryan Henderson, 18, and Chavares Block, 19 – were fatally shot. A third person, 19-year-old Martrevis Norman, a non-student visiting the campus, was shot in the leg and was treated at the nearby Conway Regional Medical Center. UCA Police Department arrested four suspects in the shooting: Kawin Brockton, 19, Kelsey Perry, 19, Mario Tony, 20, and Brandon Wade, 20. All four individuals subsequently pleaded guilty and were sentenced to the Arkansas Department of Correction. ^ "UCA Unveils Updated Academic Logo and Marketing Campaign". UCA Magazine. Retrieved July 31, 2017. ^ "Affiliates". Arkansas Space Grant Consortium. Retrieved July 31, 2017. ^ a b c d e f g h i j k l m n o p q r s t u v w x "From the Archives: UCA History". University of Central Arkansas. Retrieved July 31, 2017. ^ "Assets". University of Central Arkansas. UCA FOUNDATION, INC. Retrieved July 31, 2017. ^ "Operating Budget 2017-2018" (PDF). University of Central Arkansas. Retrieved July 31, 2017. ^ a b c d e f g "RETENTION AND AVERAGE ACT SCORE INCREASE FOR FALL 2016". University of Central Arkansas. September 1, 2016. Retrieved July 31, 2017. ^ a b c d e f g h i j "Quick Facts". University of Central Arkansas. Retrieved July 31, 2017. ^ a b c "History and Traditions". University of Central Arkansas. UCA Alumni Association. Retrieved July 31, 2017. ^ "About". University of Central Arkansas. Schedler Honors College. Retrieved July 31, 2017. ^ "Schedler Honors College". University of Central Arkansas. Schedler Honors College. Retrieved July 31, 2017. ^ a b "Academics". University of Central Arkansas. Retrieved July 31, 2017. ^ "Residential Colleges". University of Central Arkansas. Retrieved July 31, 2017. ^ "WEEKLY LIST OF ACTIONS TAKEN ON PROPERTIES". National Park Service. February 4, 2011. Retrieved July 31, 2017. ^ Jackson, Tommy (October 6, 2003). "UCA unveils WWII memorial". University of Central Arkansas. Retrieved July 31, 2017. ^ "Legacy Walk". University of Central Arkansas. UCA Alumni Association. Archived from the original on October 12, 2016. Retrieved July 31, 2017. ^ a b Brantley, Max (March 7, 2011). "Lu Hardin pleads to wire fraud, money laundering". Arkansas Times. Retrieved July 31, 2017. ^ "UCA sets fourth consecutive enrollment record". University of Central Arkansas. September 15, 2006. Retrieved July 31, 2017. ^ Miller, Logan (December 6, 2013). "Like the Phoenix". The Echo. Retrieved July 31, 2017. ^ "ASDP Mission". University of Central Arkansas. Retrieved August 2, 2017. ^ "College of Fine Arts and Communication". University of Central Arkansas. Retrieved August 2, 2017. ^ "Welcome to the College of Natural Sciences and Mathematics". University of Central Arkansas. Retrieved July 31, 2017. ^ "Departments". University of Central Arkansas. Retrieved August 2, 2017. ^ "Programs". University of Central Arkansas. Retrieved August 2, 2017. ^ "Military Science and Leadership". University of Central Arkansas. Retrieved August 2, 2017. ^ "Welcome to the College of Liberal Arts". University of Central Arkansas. Retrieved July 31, 2017. ^ "Welcome to the UCA College of Education!". University of Central Arkansas. Retrieved August 2, 2017. ^ "Theatre". University of Central Arkansas. Retrieved July 31, 2017. ^ a b "About Public Appearances". Reynolds Performance Hall. Retrieved August 2, 2017. ^ "Go Greek! Go Bears!". University of Central Arkansas. Retrieved August 2, 2017. ^ "About SGA". Student Government Association - UCA. Retrieved August 2, 2017. ^ a b University of Central Arkansas Archives. "M97-01 – UCA PRESS RECORDS COLLECTION". Retrieved March 15, 2019. ^ "ALFORD, Thomas Dale". Biographical Directory of the United States Congress. Retrieved July 31, 2017. ^ "Kris Allen". Biography. Retrieved July 31, 2017. ^ "Rick Beck". Find My Representative. Retrieved July 31, 2017. ^ "Nate Bowie basketball profile". Eurobasket. Retrieved July 31, 2017. ^ "Central Arkansas". College Hoopedia. Retrieved July 31, 2017. ^ "James M. Bridges". University of Central Arkansas. Retrieved July 31, 2017. ^ "Dee Brown (1908–2002)". The Encyclopedia of Arkansas History & Culture. Retrieved July 31, 2017. ^ "Curtis Burrow". Pro Football Reference. Retrieved July 31, 2017. ^ Stone, Peter. "Jimmy Driftwood". Cultural Equity. Retrieved July 31, 2017. ^ "Joe Farrer's Biography". Vote Smart. Retrieved July 31, 2017. ^ "Gil Gerard". NNDB. Retrieved July 31, 2017. ^ Martin, Douglas (September 25, 2010). "Dr. William Harrison, Defender of Abortion Rights, Dies at 75". The New York Times. Retrieved July 31, 2017. ^ "Bob Johnson". Find My Representative. Retrieved July 31, 2017. ^ "Benjamin Travis Laney Jr. (1896–1977)". The Encyclopedia of Arkansas History & Culture. Retrieved July 31, 2017. ^ "Scottie Pippen". Basketball Reference. Retrieved July 31, 2017. ^ Radcliffe, Donnie (1993-08-24). "CLINTON'S WINDOW ON THE HOME FRONT". Washington Post. ISSN 0190-8286. Retrieved 2018-07-28. ^ "Charlie Strong agrees to become South Florida's next head coach". ESPN. Retrieved July 31, 2017. ^ "Shawn Womack's Biography". Vote Smart. Retrieved August 2, 2017. ^ Barnes, Steve; O’Connor, Anahad (October 27, 2008). "2 Are Killed in Shooting on a Campus in Arkansas". The New York Times. Retrieved July 31, 2017. ^ Fischer, Stephanie (November 8, 2010). "Three UCA shooting suspects plead no contest". Log Cabin Democrat. Retrieved July 31, 2017.